On Wings of Eagles: Life is not meant to be lived on our . Think back on some of your favorite memories. What are they? What makes them so special? What makes these moments so memorable? I would be willing to bet that in most cases, one of the things you remember the most about your favorite life moments is who you were with when they happened. Let’s face it: life is better with people who care. Most of us have friends like the one in this story: they will stand by our sides in the good times, but at the first sign of trouble, they take off running–and in the process, leave us for the “bears”! 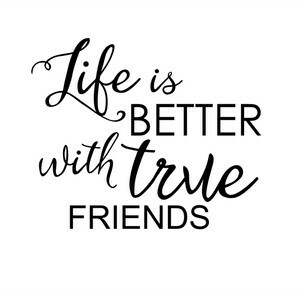 But that’s not what genuine friendship is about. Did you notice how our verse focuses on the role of friendship in hard times? Most of us want friends like the ones described in this passage–friends who will stick around through “thick and thin”. Unfortunately, it is hard to be a friend like that. Walking through tough times with others can be difficult! So how do we live out the kind of friendship described in this text? Jesus showed his dedication to us by giving his life to save ours, despite our sin. There is no question that Jesus is the most loyal friend we could ask for. Most of us want a friend like Jesus, but we aren’t always willing to be a friend like Jesus. As we strive to reflect Christ in all we say and do, my prayer is that we grow in the love we have for each other–displaying the type of friendship Jesus displayed for us. Dear Lord, we thank You for the friends that You give each of us. Help us to be good friends to those You bring into our life. In the Name of Jesus, Amen.